Tamara here with you. This is my card again. It has gone very popular since 2 weeks and today it is that very Merry Christmas day from me and all Swedish House Crafts Family. I love making mini albums and I love these fabulous cards ... they make Christmas cheerful, sweet, warm and witty! To make the DD I have cut a cardboard 15x15cm plus 2 pieces 5x15cm and a strip 4x15cm and I put around the edges the glittered washi gold ... bottom issue, it is Christmas LOL! In order to give thickness and make sure that the closure does not fail, I created some side wings. Chipboards - Arctic Sweeties - Polar Bears Hi in Frames Chipboards - Arctic Sweeties - Let it Snow, Winter & Icicles, And for the closure I used Antique Luxury Box lock ... I love !!! I left a considerable space both between the internal pages and the outer edge of my DD for the various decorations that I will enter ... it will be a very full-bodied DD LOL! I show you the whole structure and I will make a video on Boxing Day, 26 December 2018, to show you the complete album of all the photos and decorations, what do you think? It is the last post for this season, we will be back in the new year. But we still jump in between because during the holiday we are also sneaking to our craft rooms armed with cookies, drinks and screw diet plans! With this post I wish you a Happy and Merry Christmas, warmed by the warmth of your loved ones! Hi guys, well the big day is nearly here, are you ready yet? I'm here today with another Christmas card hopefully a little inspiration for you if your still making your cards. 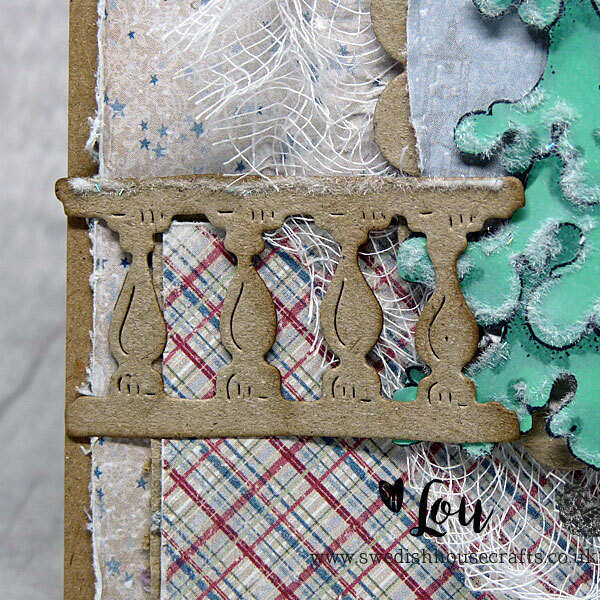 I created my card using the gorgeous papers by Roxstamps from the Peaceful Christmas pack. These papers have two of the same papers in the pack, so I used the adorable Santa with his sack from one of the papers on the base of my card. Then I fussy cut the Santa from the other one and layered him over the top using 3D foam pads. I created the star shape in the centre of my card using the Gummiapan old stars dies. I die cut two of the sizes of the old stars die in the middle of some 6" x 6" Kraft card then layered the card stock pieces up to give depth. Behind the smaller one I added a picture from one of the other papers in the pack. I made my poinsettia using Foamiran in red, simply adding some glitter on the edges when I had layered it up. Behind the flowers are some leaves made with the Lady E Designs Leaves 003 die. These I cut out of some paper from the Laserowe Love Winter song collection paper pack. I also used some of the lady E Designs Leaves 004. These I cut out of some more paper then added a hint of colour on the edges here and there with some vintage photo distress ink and finally a little glitter. Peeking out from under the flower and leaves is a adorable snowflake chipboard by Laserowe Love designs. I then added some lovely jingle bells to hang below the flower too. As I mentioned before I fussy cut out the adorable Santa and as you can see I also used the Gummiapan fluffy Trees dies too. (Once these trees sell out they won't be back!!!) I again cut out of paper simply adding some glitter on the edges. I then added glitter along the base of my card and sides to give a lovely glittery effect. 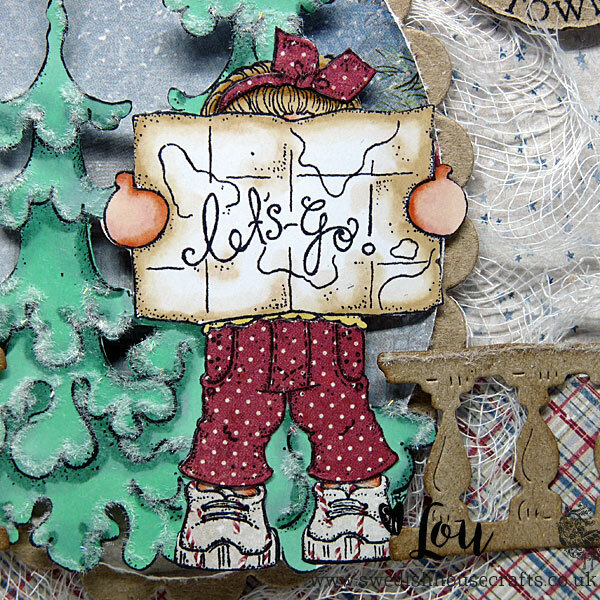 I added some of the papers from the Roxstamps Christmas paper pack on the inside too. I couldn't resist using the Gummiapan High Reindeer dies which I cut out of Kraft card and fixed onto the the left hand side of the card. Another paper was used here, I love the way this leaves a space for a verse or sentiment. Donna here with my latest project. I have decorated a laserowe chipboard 3D box. I covered the box with the new collection of papers from Maja Design called "Christmas Season". I decorated the inside panel with hang the mistletoe paper. The pom pom trim that I have adhered around the opening is from my stash! I adhered, and layered Gummiapan fluffy trees with 3D foam tape to the front. Once the fluffy trees are sold out, they won't be back in stock. The chipboard snowflakes, and let it snow sentiment are Laserowe Arctic Sweeties. The die cut deer, is from my stash! It's Lou in with a post for you today. I have been excitedly opening the days of my Magnolia stamps and Dies- Christmas Calendar 2018 and I couldn't wait to ink up my Day 1 Tilda with the little map!! My little man and I always follow NORAD tracks Santa and I decided to do a little Tilda Tracks Santa kind of christmassy card!!! And of course, I needed a few of my older Magnolia stamps to help me along, the fir trees ( though I cut the little one off the right side and just kept the two that nestle together and then masked my Tilda stamp so they went behind her), and the little Santa is coming to town sentiment circle. I love how Magnolia stamps are just timeless and go together no matter which releases they are from!! I paper pieced her trousers and bow using the scraps from my delicious Maja Designs Christmas Season 6x6 papers. And of course, the little oval behind her and the papers on the card are the Maja Designs Christmas Season 6x6 papers too. They are just too pretty not to use!! Just look how pretty the little early bird die was that came with the Magnolia stamps and Dies- Christmas Calendar 2018. I inked the edges a little and added a little fluffy snow to the top. Magnolia stamps and Dies- Christmas Calendar 2018. 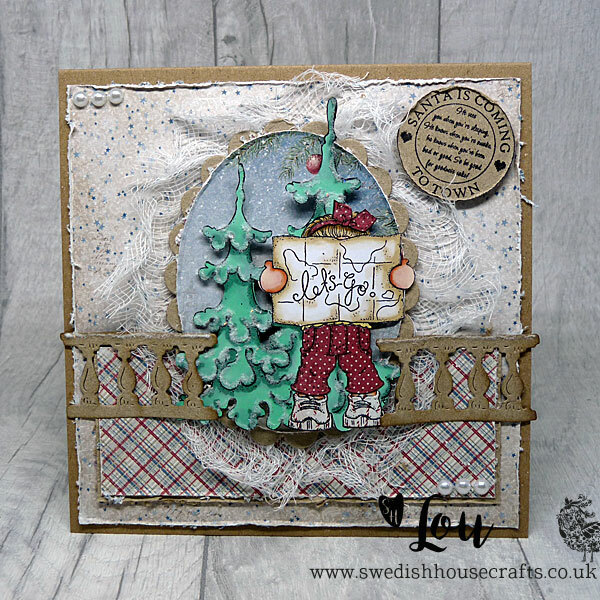 Hello, Lynn here today with a Christmas card make using the Roxstamps Christmas papers. Links to the products I've used are at the end of the post. I just love the detailing on these papers. I decided I wanted to use this Clair versafine ink in Chianti to stamp the Reindeer. To make sure everything co-ordinated I then took a piece of card and wiped the ink all over it and then used clear embossing powder on it. Then I cut the Gummiapan Merry Christmas from it. I used the same technique around the edges of the base card - means everything co-ordinates beautifully and it is a custom colour. Did you see the star hangers? Roxstamps don't make them (yet!) but I took their heart hangers and added the stars from their Nesting dies set and made by own! The Reindeer die cuts around the stamp so perfectly. I also wanted to cut another without the stamp using the Maja monochrome paper to put behind the text stamped one. Finally I added fluffy snow using an applique pen from my stash. Thanks for looking. You can find my personal blog here.